Also a redditor saw that the stats button is gone… R.I.P VG api? The type of the chest doesn’t mean much though, specially considering the rewards they give in the level system is not random. THIS is their idea of an improved progression system? Adding more levels to the existing system? SEMC phoning it in again. Hopefully they push up the 1k ICE again. Even though I haven’t been too bothered to grind up to 40 to get it again, it’s really the only reward that’s worth doing the extremely slow high level grind and it’ll reward those already at 40 even more for their activeness. That’s exactly the problem: it’s so slow that it doesn’t feel like progression. This feeble effort is NOT going to get people to suddenly start playing regularly, trust me on that. Yeah, it’s really bad how the ICE payouts are really the only worthwhile rewards from the level chests, but you can earn a lot more than what most of the level chests give you through ads, quests, and key chests in the time it takes you to level up. You know what would be awesome? Borders for completing challenges and events. Have themed events for cool borders exclusive to those events, so veterans get those really rare old borders from the beginning events if they remain active and more general borders for winning matches or killing a certain amount of jungle monsters. There could also be monetized borders to simply add to FREE borders earned by gameplay which can leave both crowds pleased. There can also be ranked borders and a really good one that can be acquired by reaching the top 100 players at least once! From what I heard, they dont want to be or copy the current personalization aspects as the other Mobas have. But they dont realize they’re missing a opportunity. This has always been their problem, so I don’t have high hopes at this late date. That’s sort of ridiculous, considering how much they have already appropriated from other MOBAs – I mean, the 5v5 map is not exactly original, is it? Im saying that because look at the present features. No other mobas have done it like Vg has. Semc want to incorporate TP into the game so then came TP boots. Semc wanted a way to personalize or add a way to customize so then came hats. Yeah, that’s exactly my point – there’s no reason NOT to incorporate ideas from other MOBAs. Lol, sorry – I should have been more clear! At this point i dont even care if its well or not. They just need to add something. And level cap is not really progression. 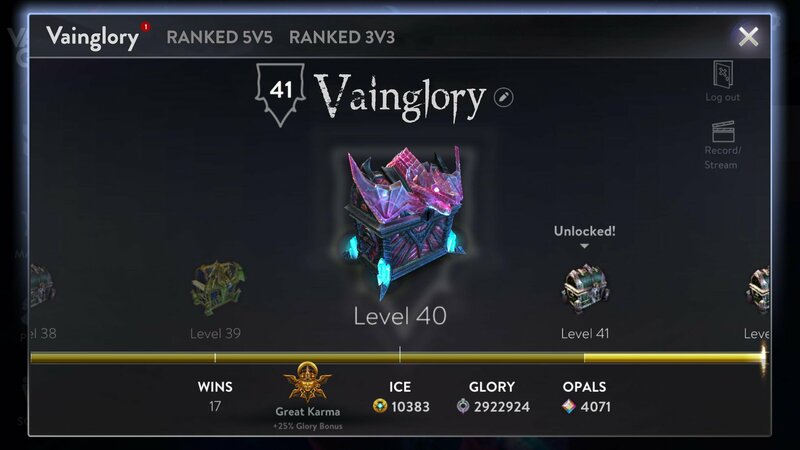 We all know how long it took to get to 40. They should really take the time to see other progression systems in competing mobas and learn from them. I’ve heard their joystick controls are actually pretty good. Do you have an issue with the joysticks, compared to the joysticks in other games?